[dropcap]A[/dropcap]s noted in my report of the 2015 Ambronay Festival, an excellent reason for going to the last weekend of the festival in early October is its incorporation of a ‘festival within a festival’, the competition for young early music ensembles held under the auspices of eeemerging, an EU initiative (and, no, I’m not going there). Each concert of some 45 minutes length takes place before a team of judges from Ambronay’s festival partners and an enthusiastic audience, which is also encouraged to participate by selecting its own winner. Once again six ensembles were chosen, this year from 47 applications (down on last year). Once again the first, perhaps most important, thing to say is that it is immensely uplifting to see so many exceptionally gifted young musicians involved in this kind of exercise. That said these gifts do not always take right the direction, as the opening concert on the morning of 8 October demonstrated. This was given by Nexus, an ensemble consisting of two recorders, cello and keyboard playing 17th-century Italian works by Legrenzi, Castello, Marini, in addition to featuring vocal items by Merula, Barbara Strozzi and Monteverdi sung by mezzo Marielou Jacquard. Sadly, as with one of the ensembles last year, Nexus showed scant evidence of having paid attention to 17th-century style, their performances showing little sign of nuance, colour or the bizzarie (imagination) so essential if this music is truly to come to life. I find it odd and not a little depressing that talented young musicians such as these are not getting (or seeking?) more guidance on matters of musicology and style. 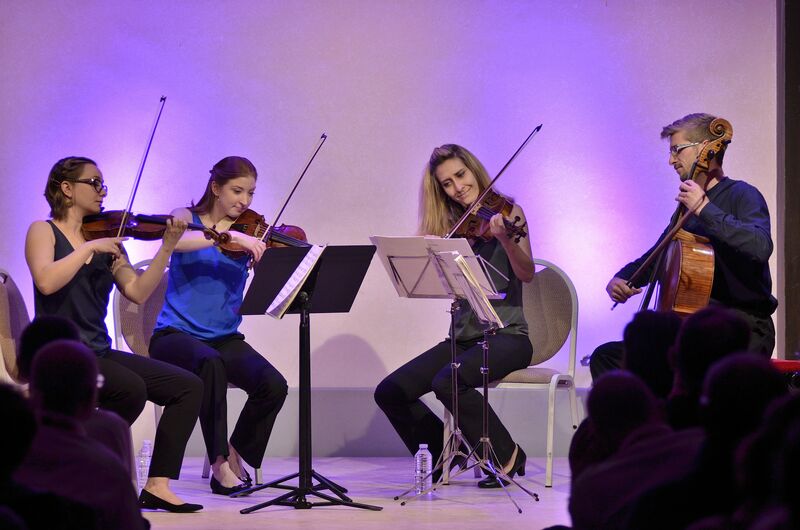 The succeeding program by I Discordanti, a vocal quartet with continuo support of gamba, theorbo and harpsichord featured repertoire from much the same period. They perhaps concentrated a little too heavily on chromaticism (it really is time Luigi Rossi’s ubiquitous ‘Toccata settima’ was given a rest), but brought a welcome sense of the stylistic needs of the music. This was particularly true of two extended cantatas by Rossi, which were well projected. I Discordanti are not yet the finished article, but they deserve every encouragement. The opening concert of the afternoon session introduced Prisma, yet another ensemble that specialises in early 17th-century instrumental music (Cima, Bertali, Salomone Rossi etc. ), its membership being violin, recorder, gamba and archlute. Their approach was a striking advance on that of Nexus. Violinist Franciska Hajdu not only possesses an excellent technique but has also taken the trouble to employ a 17th-century ‘Biber’ bow (though not yet to have her violin set up with low tension strings) and throughout played with a real sense of style well matched by her partner, recorder player Elisabeth Champollion. The continuo playing was equally of a high standard and I would not quarrel with voting that saw Prisma end up with the audience prize. For me their main competitors were the succeeding Goldfinch Ensemble, an ensemble of former students of The Hague Royal Conservatoire comprising of violin, flute, gamba and harpsichord. They were particularly impressive in technically accomplished and expressively musical performances of two fine trio sonatas by Élisabeth Jacquet de La Guerre. This is another group that is certainly worth keeping an eye on. On the following morning two remaining ensembles presented programmes, the first of which was mainly devoted to Haydn’s wonderful late String Quartet, op 77/1 in G. The performers were the very young-looking Consone Quartet, who had a very good shot at a work they will play better when their own maturity comes closer to matching that of the music. This was particularly true of the Adagio, one of Haydn’s most deeply profound quartet movements. Finally The Curious Bards, an ensemble based in nearby Lyon that specialises in the research and performance of traditional Irish and Scottish airs and dances. Their programme of 18th-century arrangements was put across with great accomplishment and verve, but I would question the validity of its inclusion in this context. And isn’t there something rather ridiculous about an audience sitting in serried rows in a 21st-century concert hall listening to music that was never intended for such a purpose? Still, to avoid ending what was overall another joyous experience on a sour note, it must be confessed that said audience loved The Curious Bards.